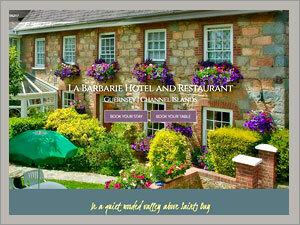 Guernsey hotel, restaurant and self catering apartments. Web sites from Web Design by Bazil. A comfortable Guernsey hotel, restaurant and self catering apartment complex set in a rural location combined with a popular award winning restaurant; make La Barbarie Hotel one of the best Guernsey hotels for relaxing short breaks, activity breaks and walking holidays. A family owned hotel with a genuine desire to consistently achieve and exceed client expectations in an efficient and friendly manner positions La Barbarie as one of the best 3 star hotels in Guernsey. Responsive website designed, maintained and hosted by Web Design by Bazil.